Are You Getting The Most From Your Content Marketing Investments? Content marketing leaders need to optimize and scrutinize their content marketing activities, getting the most from their investments. Unfortunately, many teams are not succeeding and falling into the Trough of Disillusionment (see “Hype Cycle for Digital Marketing and Advertising, 2017” (Gartner subscription required). The current state of content marketing shows promise, lots of promise, but only when teams raise their level of maturity. Content Marketing Institute’s 2018 survey of B2C marketers in North America found that only 24% of respondents rated their content marketing programs’ as “very successful” or “extremely successful.” Yet, over 90% have a content marketing function. Failing to take full advantage of their content libraries. They lack a firm understanding of what content may already exist across their various platforms, preventing them from effectively refreshing or contextualizing high-performing content. Creating too much generic content, ignoring the need for personalized content that delivers a stronger customer experience across the buyer and customer journey. Failing to institute content implementation guidelines and templates, that aid in internal and external partner reuse. Don’t create undue overhead with your templates, create them to aid with document design (for future reuse or customization) and content use and extensibility. To optimize your program, ensure your team has a content strategy defined (only 37% did in the survey above). The strategy should be updated as corporate or business goals evolve. Your team must have a content marketing plan, based on data-driven insights, sales goals, and content library knowledge. Ensure your team is performing regular content audits. Reusable high performing content is ‘gold’ (content that can be reused or contextualized) reducing cost, reducing risk, and accelerating content creation. Push your team to reuse, contextualize, or personalize before creating new. 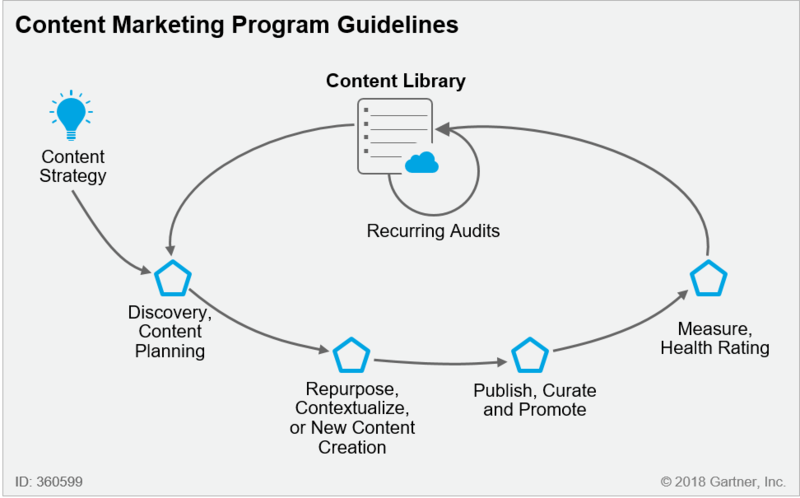 Content marketing, when combined with an efficient operating process and set of guidelines that mandate regular audits, content repurposing and contextualization, and template use, allows marketers to deliver outstanding business results at low cost. To boost your content marketing ROI, check out my latest research on “Getting the Most From Your Content Marketing Investments” (Gartner subscription required).